In early May five of us collected a big load of logs as planned, and we got a start at filling the east platform. Now, before summer really sets in we need to finish filling that east platform and the small platform right next to the screened porch. That will put us in good shape for the 2014 season. In the fall we will put firewood away for the 2015 season. Anyone available to chain saw, split, haul, stack and cover? Let me know if you can help. I'll be back in touch with whomever volunteers. Don't assume we are working. We'll only go ahead with this if there are at least three of us to work. All previous years we finished the clean up soon after the season ended, then no work days until fall. Now I know why. Work days don't happen with Spring in the air and Summer right around the corner. So much else to do. Peter has a lot of hardwood available, and we really do need to get a start at replacing the 5 cords or so that we burned this year. for this I have Peter and Jon lined up for this Thursday. Jon and I will leave my house at 12:15 p.m. to go about a mile up Rt. 63 to the farm owned by Peter's mother, Becky Reed, where Peter lives. Call or message me if you want to join us. If you can help with any of these tasks, contact me to set up a time. We'll have our own little work day. Isn't this new approach just the bee's knees!!! Syrup sales have been going well, but I seem to have enough to let individuals or families have up to one gallon each. If you want to purchase syrup, you can get it self serve from the ping pong table in the shop or make other arrangements with me. Peter has had to cancel on getting wood from his farm. Jon is the only one who has said he would be here on Saturday. I'll confirm plans with anyone who contacts me. Assume we are not working unless you contact me and hear back otherwise. Peter has a lot of hardwood on his farm just a mile up Rt. 63. We need to replace the 5 cords or so that we burned this year. Thus, a work day. We need people who can chain saw, load logs onto the dump trailer, and haul the brush to the burn pile as we de-limb the logs. The latter doesn't take a lot of strength, but all of this is a bit strenuous. 4:00 p.m. Milk, tea, and cookies on the porch. NOTE: NOT THIS SATURDAY, BUT A WEEK FROM THIS SATURDAY. It would be especially helpful to know who is coming for this work day, but as always come even if you haven't signed up ahead of time. Also, the same Saturday (that's a week from this Saturday, not this Saturday, remember!) is the Cushman May Day Celebration. Pancake b'fast starting at 9:00 a.m. at the Cushman Scott Children's Center, 71 Henry Street. Morris dancing at The Center, then a procession to the Cushman Green for a May Pole and MORE Morris dancing (it's hard to get those Morris dancers to stop). It's 33 deg. F, sleet has turned to rain. Yuk! If tomorrow were like this, we would cancel the work day, but it will not be so. Prediction for tomorrow is partly cloudy, high of 42 deg. F. WE WORK! 4:00 p.m. (or whenever we get done working) Tea, milk and cookies on the porch. See pdf document below the previous msg for the work that needs to be done. HELP! If you would like to purchase syrup, let me know. We'll start with a 2-qt. maximum purchase per individual or family to be sure everyone at least gets some. I think there will be plenty and unlimited purchases will be possible later, but I'm not sure. Lot's of people like to buy our syrup. We did a lot of work and ate well last Saturday. Many BIG tasks got done, most notably washing 129 buckets, spiles and hooks. We still need to finish up some miscellaneous tasks. 4:00 p.m. (or whenever we get done working) Milk and cookies on the porch. Did I come up with something a bit more healthy to have as an alternative to milk and cookies? I have this itch in my brain that says I did, but I can't remember what it could have been. If anybody knows, clue me in. See attached pdf document for the work that needs to be done. If you have been an active Maple Mob member for a few days or more this season, you'll get an email from me later this week with an indication of how much your pittance of syrup is for the year. I'll start selling syrup then too. For a while I'll limit purchases to 2 qts. per individual or family to be sure everyone who wants some can get at least that much. In a few weeks, I expect we will still have enough that you can get more. The Hampshire Daily Gazette (Apr 8, 2013) had a very good article about this year's season in this part of Massachusetts. The title is "Maple Sugar Season Still Going, Record Year For Some." A splendid season it has indeed been for us. Now, the opportunity you've been waiting for. Clean Up Time. We can use LOTS of help. 1:00 - 2:00 Eat beef pot roast, potatoes, carrots, etc. As always it makes me feel all warm and fuzzy to know who is coming, but come even if you haven't let me know. For those of you who don't get to The Sugar House, two photos are attached of this year's crop in jars. Also, the Ethics Directorate of The Maple Mob has admonished me for attempting to fool Maple Mobers with my April Fools message. They have required me to gather data on the impact of my indiscretion (their words). Please respond to the following scientifically designed questionnaire to determine the truth. Email your response to me. I will white out your return address to insure confidentiality, besides I wouldn't retaliate even if I did know who chose C. Really! Yes, the previous message was April Fool. The weather forecast is true, but our holes are 6-7 weeks old and dried up. Peter tapped a few trees just a couple of weeks ago. Those continued to run until a day or two ago. It will be interesting to see if they run after the freeze tonight. Also, we'll see if they produce buddy syrup or not. It looks like our total for the year will be about 53 gallons of syrup. We finished the boil of what we thought was the final Batch #19 on Saturday and pulled all taps. We need to re-hang all the buckets to catch this unusual April string of perfect sap run days. Contact me for detailed plans. And, we'll get a bit more tomorrow. All taps have been pulled from the golf course and the fence line between the golf course and CoHousing. All hands on deck. We'll pull the rest of the taps, clean, and boil. Rob will be coordinating activities. No work on Sunday. I'll get home late Sunday night. We only collected 15 gallons of sap. Aaaaargh! Ah, the mysteries of sap flow. My guess would be (for what it isn't worth) that it's primarily a matter of holes having dried up. We did get an additional 8 gallons from Peter and we have 23 from yesterday. So, 46 gallons are being boiled this evening. The new plan: Thursday - nothing. Friday - I'll pull the golf course taps and check the rest. anything that's left plus whatever Peter brings in by then. collect and boil lots on Saturday! And still, check with Rob or Henry if you want to help, or as always just stop by. I'll be checking my email occasionally, and I will be sending out these messages based on what Rob and Henry tell me. Joyce and I are visiting our son and his family in Swarthmore, PA. Oh, I wish I could be there and here both. 18 deg. F at 6:00 a.m. It will be interesting to see how this translates to sap flow this late in the season. I'll predict 80 gallons. We are down to about 110 taps still in, having pulled ones that seemed dry. Do come help gather starting at 3:00-3:30 p.m. if you can. I'll be in PA. Some of the other regulars aren't available. We finished off Batch #18 and filtered it. It looks to be about 1.5 gallons of syrup. That would put our total for the year at about 51.5 gallons. Collection today was very light, only 23 gallons. It did not get below freezing last night. If we don't get a cold night within a day or two, the season is over. Let's assume a cold night tonight and plan on the usual collection starting at 3:00-3:30 p.m. tomorrow (Wednesday). I'll be away from early tomorrow morning through late Sunday night. Check with Rob or Henry if you want to help, or as always just stop by. I'll be checking my email occasionally, and I will be sending out these messages based on what Rob and Henry tell me. Joyce and I will be visiting our son and his family in Swarthmore, PA. Here's what needs doing. Help if you can. Can Batches #17 and #18 (they are filtered). And by all means begin looking forward to the most fun of all -- END OF SEASON CLEANUP. Coming right here......soon. 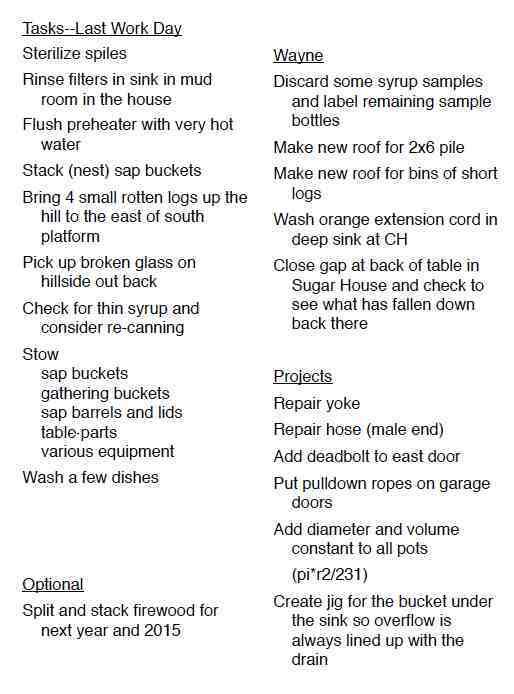 Featuring 129 buckets to wash, evaporator pans to scour and more. We finished off Batch #17 and filtered it. It looks to be about 2.6 gallons of syrup from 128 gallons of sap, a ratio of 48.5:1 (a typical late season ratio). We gathered 50 gallons of sap today, and Erik brought 18 gallons. We are boiling that 68 gallons now. We will stop for the night soon. I'll finish it tomorrow.....maybe with some help (hint, hint). Sapmeister to finish this boil. Take empty canning jars from storage. Put them out in the Sugar House. Grade the syrup in the manner of The Maple Mob (not to be confused with Vermont Standard). Bring firewood into The Sugar House. Well, ain't we rock candy! I think we will have over 50 gallons of syrup when we finish boiling the 80 gallons of sap collected yesterday. ....and the sap's still running. Yesterday the inexplicable urge to clean things was satisfied big time. Everything got cleaned up in addition to collecting sap and boiling and canning. Fantastic! Of course, this is sugarin' so there's no end of things still to do. Get a load of this. Take empty canning jars from storage.Wash if necessary. Wash recently canned syrup jars. Move to ping pong table. Move all canned syrup to ping pong table. If you are available anytime today, contact me to help. I'll be working pretty much full time on sugarin' all day. The sooner you let me know you are coming, the happier I will be. "Ain't I rock candy" gets sung for the first time at about 1:36. I warned you that I needed help with these subject lines. I hope my run-ins with spam filters are solved. Unfortunately, if you aren't getting email msgs from me, you aren't getting this. I hope, if someone isn't getting messages, they will contact me. We'll deal with it. Another really productive two days in the Sugarbush has come to a close. We finished boiling Batches #15 and #16 last evening and today, and we filtered some from earlier and all of these most recent batches. We are all caught up with filtering. Today we collected 48 gallons of sap (Batch #17) which is waiting to be boiled tomorrow. Our total sap collected (most of it) or received from friends (maybe one half percent of the total) is now 2192 gallons. By far the most we have ever had. When it's all canned we should have about 48 gallons. .......and the sap's still running! 1:00 or so start collecting sap and start boiling Batch #17. Make maple candy if there is someone who can go it. I'll be away all afternoon as explained in previous messages. We had lots of visitors today who raved about how good the syrup tasted. They got some that was warm, right out of the filter. The weather forecast suggests that this will continue on into, and maybe to the end of, next week. A light day. Temperatures didn't seem that much lower yesterday after we collected and today before we collected than previous days, but we only got 38 gallons of sap. Unpredictability strikes. The weather forecast remains about the same. Cold nights and warm days through the weekend and on into next week. See P.S. #2 for what one weatherman says about this so called Spring of 2013. None, really, unless someone wants to help me scour the pan this evening, but that's not necessary. After I get the pan scoured Henry and I will get the boil of Batch #15 started either tonight or tomorrow morning and slow boil it. Collect sap tomorrow (Friday) starting at 3:00-3:30 p.m. Collect and boil Saturday, Sunday, etc. and, I HOPE, finally make maple candy. Maybe more big day Sunday although I will not be around in the afternoon. See P.S. #3 . You too might want to join me for Irish dancing at the Montague Grange. Collect sap. Some of the regulars are not available. Contact Henry to help before noon. I will be away until noon. If you wish, at noon bring bread or something to go with my New Orleans Beans And Rice And Roast Pork (little pieces in with the beans and rice) and PBJs. Join us for an afternoon of all things sugarin' (see above). Not sure. Unpredictable (but you knew that). We may have a lot of sap and more boiling, etc., or not. There was plenty of sap left in both pans, but not enough in the bottom pan. While I was in the house the bottom pan made syrup and boiled for an unknown amount of time before being discovered by Mark who added some sap from the top pan and alerted me. It was boiling nicely with the mass of little bubbles just at the top of the pan. It looked more like boiling crankcase oil than boiling maple syrup. I added the rest of the sap from the top pan and finished if off normally. The bottom of the bottom pan has a thick layer of black burned syrup that I will scour off with a rotary sander on a drill. Not fun. The latest indications are that the weather pattern will continue to favor colder storms that bring snow, in part, from the Central states to the East into early April. The pattern may translate to a longer heating season, higher heating bills and more time, money and effort into snow removal later into the season than usual in some communities. The pattern can also negatively influence some spring weather-related activities. The long-range weather patterns from the Central states to the Appalachians and even the East Coast point toward additional storms and just enough cold air when they come calling to bring more snow and a wintry mix, despite the official arrival of spring on Wed., March 20. Sean Nos and Irish Set Dancing by The Sunny Banks! featuring Rebecca McGowan (dancing sean nos and calling sets) accompanied by Corey Walters (Flute) and Jonah Sidman (fiddle). Sean Nos dancing is the 'old-style' Irish step dancing similar to Appalachian flat-footing or Quebecois step dance. We will present an hour of sean nos dancing and Irish tunes followed by participatory set dancing. The Irish set dancing (ceili dance) is similar to square dancing and is fast paced and energetic. Some of you may have danced Kerry Sets which are a type of Irish ceili dance. I have posted there the details of our syrup production through Batch 14 and summary statistics for all the years we have been sugarin', 1998-2013. P.S. #6 Do you think this P.S. thing is getting out of hand? I'll try to control myself from now on. Does anyone actually read this far down? We combined 110 gallons of sap collected today with the 43 gallons of sap we collected on Monday. That's Batch #14 and it is boiling now.) Wow. When this batch is finished we will have 45 gallons plus of syrup total for the year so far. The forecast is for perfect lows at night and highs during the day escalating to a high on Sunday of 45 deg. F.
AND, it is even more amazing. The forecast calls for the pattern to continue through all of next week. Oh, My! but I repeat myself. We are seeing some dry taps. We've pulled a few. However, most are still going strong. A sapmeister for tonight or tomorrow during the day or tomorrow night or tomorrow during the day or that night, etc. We've got a LOT of boiling to do. If you can stoke the evaporator for a time, contact me to sign up. Collect sap tomorrow (Thursday) starting at 3:00-3:30 p.m. Collect and boil Friday, Saturday, Sunday, etc. Sapmeister needed tonight and tomorrow. Like today, help definitely needed for collecting sap tomorrow. Some of the regulars are not available. Seth indeed fixed the email problem. All the outgoing mail servers that I had access to decided I was a spammer. Now, thanks to Seth, I have one that knows better. The 43 gallons of sap we collected yesterday (Monday) are partially boiled. We will add the sap we collect tomorrow (Wednesday) to it and finish the boil tomorrow night (or Thursday morning if we don't want to stay up late). Collect sap tomorrow (Wednesday) starting at 3:00-3:30 p.m.
Continue boiling after we collect tomorrow. Collect and boil Thursday and Friday. Help definitely needed for collecting sap tomorrow. Some of the regulars are not available. I'm having a really weird email problem. Messages sent as Maple Mob messages appear on my computer to have been sent, but no one gets them. The only thing that messages that don't get sent have in common (I think) is that the subject begins with "MM--". Weird! I'm hoping to have Seth Seeger help me fix the problem today. It is now 8:30 a.m. on Tuesday. We collected 43 gallons of sap yesterday. Henry started boiling it last night. I think we will wait for further boiling until after a collection tomorrow (Wednesday). I checked some buckets earlier this morning. The temperature dipped below freezing last night and is just now getting up to 32 deg. F. No sap flowing, frozen sap in buckets. Our traditional gushers are about 1/3 full, others have just an inch or two. Some are dry. As I have said before, typical late season variability. Third attempt. Second attempt was at 8:45 p.m. First was at about 8:00 p.m. I'm taking the attachment off to see if that helps. Eleven of us did everything today as planned except make maple candy. Maybe we can do that next weekend. We ended up with 66 gallons of sap for Batch #12 and we finished it off at about 4:00 p.m. We continued to boil Batch #13 which consists of 83 gallons of sap gathered today. If my estimates are right, when we are done with this batch we will have made about 42 gallons of syrup. See attached spreadsheet for details. All filtering is done through Batch #12. Canning is done through Batch #11. Batch #13 is being boiled right now. At 6:00 p.m. there were about 72 gallons left to boil. I will slow boil this evening and tomorrow. Anybody want to be sapmeister anytime during that period? We will plan to collect sap tomorrow starting at 3:00-3:30 p.m. Predicted lows are fantastic all next week. Highs are ify. Maybe they are high enough that we will get good runs, maybe not. We will just saunter off into the sugarbush each day and see what Mother Nature provides. Now, it is true that we did everything today as planned, but apparently we didn't plan to wash pots and utensils and dishes, lots of them. And, apparently we didn't plan to have enough canning jars to continue canning next weekend because we don't. Help needed, preferably tomorrow (Monday) or Tuesday, for someone to satisfy the inexplicable urge to clean. Let me know if you will rise to that occasion. It is now 1 a.m. on Sunday. I tried to send this before I left for a contra dance (7 p.m. Saturday evening). Don't know why it didn't get to you. Here's another try. We have 46 gallons of sap on hand, most collect by Henry this afternoon. Several buckets were nearly full, a couple overflowing. Others have some, a little or none. Typical late season variability. I'll start the boil in the morning. Activities for the day are as previously announced. I tried to send this twice on Friday (3/15). Now I'm trying at a little after midnight Saturday a.m. Very very very little sap flow today (Friday). Tomorrow (Saturday) looks to be the same. Tentative plan is for next work to be Sunday (3/17). Start at noon collecting sap. Mark your calendar. Noon now, and it still isn't above freezing and it's windy and its cloudy. No sap run today. Not what I predicted. We did get a cold night, and cold nights are predicted through the weekend at least, but it's no longer clear whether the days will be warm enough for significant sap runs. All work on hold until we get a warm day. I did finish boiling Batch #11 which was 110 gallons of sap (64 that we collected on Monday, 18 from Erik, and 28 we collected yesterday). It has the look, smell and taste of Grade D syrup. Nobody I know of except The Maple Mob revels in syrup with an "off taste", but there are a bunch of us you really like the very hearty taste of this very strong dark syrup. Don't tell the FDA. For those of you keeping score, the attached spreadsheet summarizes the season to date. If my estimates are correct, we have 39 gallons of syrup. We did in fact get a small run today _as predicted_. After throwing out some yellow sap (also _predicted_), we collected 28 gallons which we added to the boil of sap from Monday. So the current boil, Batch #11, has 110 gallons of sap in it. I predict this batch will be Grade D. Some of it has been boiling since Monday afternoon and won't be finished off until tomorrow. (No late night sugarin' for me tonight. I've been going strong all day and I'm going to bed.) Also, today's sap is from a warm spell which contributes to darker syrup. I could use some help tomorrow (Thursday). I predict a moderate run tomorrow. It will get good and cold tonight, but since there is no sap running now, what we collect will only be from mid-morning tomorrow until mid-afternoon when we collect. Thursday night is predicted to be even colder. Friday's collection will, I predict, be huge. It will include was runs tomorrow after we collect and what runs on Friday up to the time we collect. If you can help prior to 3:30 p.m., let me know. For collecting, just show up. Two young men who like to help gather sap get out of school early tomorrow, so all work will be moved up. Here's the current pretty predictable plan. Early morning I restart the boil of the sap we collected yesterday (plus 18 gallons that Erik dropped off last evening so we have 82 gallons in this batch). Anyone wanting to be sapmeister can have the job anytime after 8:00 a.m. (or earlier if you can restart the boil yourself). 11:00 a.m. - 1:30 p.m. I could use help with canning and finishing off the boil. 1:15 or so the boys will get here and collecting will happen for an hour to an hour and a half. I'm pretty sure we will not get much sap and much of it will be very yellow. Warm nights and warm days do that to sap. We do need to collect to get the buckets empty in preparation for gushing (we hope) later in the week. The promise of a cold night failed. We only got 64 gallons of sap today. The two full buckets I found in the morning were the only full ones, and many buckets had little in them. The run has dwindled. Still, we're doing great. I think we have about 38 gallons of syrup, although one of the unpredictable things is the relationship between my estimates and the reality of what we end of with in jars. ......will see. Maybe we will have some good runs starting Friday, maybe even starting Thursday. Wednesday we will can syrup and split wood whenever anyone is available to help me. We will collect sap starting at 3:00-3:30 p.m. We won't get much sap, maybe really not much, but we will get the buckets completely empty in preparation for the run we hope will come. Help on Wednesday will be appreciated. Let me know when you can come if it will be before 3:00, or just show up at 3:00 or soon after. We'll do whatever we have the Maple Mob power to do. We have a few buckets that are nearly full at 10 a.m. Don't know how many, but the two gushers on the tree west of the house were within half an inch of full about an hour ago and dripping moderately fast. I visited about a dozen buckets and found one other that was over half full. Technical Note: By this time in the season, some holes are starting to dry up. Productivity varies from dried up holes to gushers. Oh, those mysterious maples! If anyone would like soon to visit more of our buckets and collect any that are over half full, that would be helpful. I've got enough other sugarin' and other tasks to do that I won't get to many more. Now, to put this in perspective, there aren't many buckets like the two on the tree west of the house that will overflow before our 3:30 p.m. collection, and those that do overflow don't overflow a whole lot. We still get a bucketful of sap from them. So, it's not a great loss if we don't get to them until after 3:30, but it is nice to get ALL that sap. P.S. The weather forecasts last night varied widely as to how cold it would get overnight. Unfortunately, the predictions on the warm side proved true. It did not go below freezing. Thus, many taps dripped all night and are still dripping. Unfortunately, that will cease sometime in the next 24 hours or so. We will get an increase in dripping when the temperatures warm up to 50 or so this afternoon, but nothing after that until we get a freezing night again. Current forecasts say we may get freezing nights Thursday, Friday and Saturday. Here's hoping. Yesterday we ended up collecting a total of 100 gallons of sap. Others donated 35 gallons and we finished that batch (#9) off today. We also canned all syrup through Batch #8. Today we collected 98 gallons of sap and started boiling it (Batch #10). Gather sap at 3:30 p.m.
Do join us! Especially for gathering sap. We may get another humongous run if it gets really cold tonight. When we finish canning through today's sap, I'm estimating that we will have about 36 gallons of syrup. So that you can study for the quiz, attached is a summary of the season to date. P.P.S--According to my count 40 of us ate pancakes and did the work of sugarin' yesterday. It was a little crowded at times, the food was really good, we had some excitement with a burned pan (not serious, but exciting at the time) and a near boil over (not serious, but exciting at the time) due to distracted sapmeisters, and we got a lot of work done when the eating was done. Gotta work on that distraction problem next year. This morning a whole bunch of us ate pancakes, pancakes and more pancakes w/syrup.......and extraordinary sausage donated by Simple Gifts Farm, and all the trimmings. Wow! We've collected about 80 gallons of sap and it's running fast from some taps, less so from others. Not unusual for it to be uneven at this point in mid-to-late season. We also got a lot of the syrup filtered that has been waiting. We still need to can it. Collect sap at about 3:30 p.m.
Or, to be less poetic, HELP! Rob and Cat do excellent elf duty, but one or two additional helpers would sure make setting up for the pancake breakfast a lot easier. Most needed are one or two people arriving at 8:30 a.m.
Then another one or two arriving 9 or 9:30. Let me know if you can do it so I don't have to set my alarm clock even earlier than I would like. And, of course, cleanup provides almost unlimited relief for the inexplicable urge to clean that is so inexplicably rampant among Maple Mob members. When the time comes, do not resist. The lack of cold nights has taken its toll. We only collected 17 gallons of sap today. Not very productive for volume of sap but important to do to get the sap out of the buckets. Friday and Saturday nights may be cold enough for sap to run again on Saturday, Sunday and Monday. After that, who knows. A summary of the season through yesterday's collection is attached. In brief, when it all gets canned we should have 31-32 gallons with a ratio around 43:1. Soooooo, nothing to do tomorrow (Friday) although we do have quite a bit of syrup on hand, some of which still needs to be filtered, all of which needs to be canned. We'll do that on Saturday during and after eating pancakes, etc. Lots of other tasks as usual, and if someone want to make it happen we can make sugar on snow (if there is snow) and/or maple candy (snow not required). P.S. With nothing much to do for a day, 'tis a good time to reflect on the $18,000,000.00 maple syrup heist in Canada that first made news back in early January. A recent article about it is attached as is an earlier article that I think I already distributed to y'all. Quite a story! "The Great Maple Syrup Heist" Hmmmm. Doesn't have quite the same ring as "The Great Train Robbery." Same story as yesterday and the day before but finally a little less so. We didn't get a very cold night last night. We collected 100 gallons of sap. I restarted the boil of yesterday's sap at 7:00 a.m.this morning and slow boiled all day, finished off yesterday's batch at about 5:00 p.m. and continued on with today's sap. I've been away contra dancing for the evening. Rob kept up a fast boil until 10:00 or so. I just stoked the evaporator for one last time and will soon be off to bed. Low tonight is predicted to be only 30 deg. F. I'm predicting a small run tomorrow, but enough that we should collect. Collect sap starting at 3:30 p.m.
Let me know what you can help with or just show up. I started the boil this morning at 3:00 a.m. and alternated sleeping and getting up about every hour and a half until 8:00 a.m. when I got up for good. We slow boiled all day, finished off yesterday's batch at about 3:00 p.m. and continued on with today's sap. I've been away for the evening. Others have kept up a fast boil and are still at it. I'm going to send this message and go to bed. I'm predicting another big run tomorrow, then without a really cold night, a small run on Thursday. Will we have sunshine? Not much, but it didn't seem to matter. We collected 156 gallons of sap. Several buckets were overflowing. It is still dripping moderately fast. I started the boil. Am now (5:30 p.m.) off to a dinner date with Joyce. I'll be back about 7:00 p.m.
Sapmeisters needed all the time, anytime, for the next few days. ......well, what don't you understand about "all the time, anytime." Seriously, sign up for a sapmeister slot if you can. If you haven't done it before, OJT is available. Collection of the fullest buckets needed tomorrow morning, anytime, whatever suits you. Regular collection starting at 3:30-4:00p.m. tomorrow (Tuesday). We will almost certainly get another 150 gallons of sap. Did it get cold enough last night? Will it get warm enough today? If answers are "yes", then renewal. I'm sure we will have at least a small run today, maybe a medium one. Join us then or soon after. We'll probably be done by 5:30 p.m., maybe even by 5:00. Detailed plans for the rest of the week coming soon. Watch this space. On Sunday we finished off about 3.5 gallons of syrup from 144 gallons of sap (40:1). Our total to date is 21.7 gallons of syrup from 935 gallons of sap (43:1). See attached pdf document for detailed statistics. We don't know what to make of the Batch #3 ratio of 36, then the Batch #4 ratio of 57. That's what our records show. ?? See photo at very bottom below. I'm running out of superlatives and catchy subjects for these messages. The hot dogs cooked in maple syrup were very good today (Saturday). We had music to work to. Twenty people helped. We finished off about a 2-gallon batch of syrup. We only collected 7 gallons of sap. It was not cold enough last night to get the sap flowing again. Here's hoping that tonight will get significantly below freezing. We still have about 50 gallons of partially concentrated sap on hand. I'll restart the boil tomorrow (Sunday) morning early and keep it going until about noon. I'll also build a platform around the sap barrels. The mud is getting quite annoying. I think at best we will only get a moderate sap run, so collecting will be optional. Details to be announced soon to include sausage, orange juice and applesauce. Do you have one to donate? I'm using a lot of exclamation marks this year. The season deserves it so far. First, six of us did a ton of cleaning, filtering, canning, splitting and bringing in wood, and maybe a few other things. Other thing--collecting sap. Wow. We collected 113 gallons which accumulated since our Tuesday collection. That's three day's run, 0.3 gallons of sap per day per bucket (126 buckets) with temperatures at night just barely, if at all, dipping below freezing. The Borrell family dropped off 7 gallons. The current boil is 120 gallons. I'm slow boiling now. I will start it up tomorrow morning, or you can be sapmeister. Come early, come often. Hot dogs cooked in maple syrup for lunch. I'll have some hot dogs and buns. If you eat a lot or have a group coming, please bring your own. I'll make a pot of baked beans. Other hot dog friendly foods would be welcome. Bring something to share if you like. Musical instruments and singing always welcome. About 18 gallons of syrup have been canned. We'll get an exact count tomorrow. Subject: MM--Friday Detailed Work Plan / Help! Here are the times and the lineups. Additional helpers welcome, especially for 3:30 p.m. on to collect sap. Little dripping in the sugarbush. We need a cold night. Maybe that will be Friday night according to the weatherman. In the meantime, we are getting caught up. Peter and Amanda and I filtered and canned a lot of the syrup yesterday. I'm unavailable all day today, but Friday we can finish the canning, do a lot of washing of pots and things (inexplicable urges to clean can be satisfied), and gather the sap that has accumulated during this lull. It did run some before the lack of cold nights had their insidious effect. Let me know how you can help. I will choose work times to match availability. Again, let me know how you can help. I will choose work times to match availability. It's raining, light but steady. Mud everywhere. We even have puddles in The Sugar House, although they are gravel puddles, not mud puddles. --No need to gather sap today. Some of the taps that are "gushers" are maybe 1/4 to !/3 full and dripping slowly but they won't overflow given the diminishing run we are experiencing. Other buckets have a little in them. When we do collect we will maybe get 40 gallons of sap or so. Low of 31 deg. F tonight won't start a new run. Maybe Thursday night with a low of 28 or Friday night with low of 25 will start things up again. --I would like to get some filtering and canning done. Anyone available to help me during the day this afternoon or Friday afternoon? (I can't do it on Thursday or in the evenings.) We would need a minimum of two hours to make it worth setting up, three hours would be better. Call or message me to make a plan. Help needed this afternoon or Friday afternoon for filtering and canning. In case you are only scanning this msg, see sentence above. We collected a whopping 129 gallons of sap from 126 buckets. That's even more than the one gallon per bucket we got yesterday. Another really good run. Last night, like the night before, the sap kept dripping until the temperature dropped below freezing, then started dripping again this morning when the temperature rose above freezing. That was a long time dripping, even more so than last night because the temperature was below freezing only for a short time. In fact, I thought it probably wasn't a cold enough night to produce a good sap flow today. Wrong! We finished Batch #3 of syrup today, about 3.5 gallons of syrup from 148 gallons of sap (42:1). Total syrup is now about 15.2 gallons. Best beginning of a season ever for us, I think. Today we also got 8 gallons of sap from the Borrell family but used 5 gallons to beef up Batch #3 . Total sap in Batch #4, which is being boiled as I write, is thus 132 gallons. If we fast boiled it would take about 13-14 hours to boil that. We'll probably have 5-6 hours left to do tomorrow if we mostly fast boil, longer if we slow boil. Collect sap starting at 3:30-4:00 p.m.
Help with all things will be appreciated! Call if you want to find out how the weather is affecting us. Maybe the run will be light. Maybe awful weather will limit what we can do. Don't know. Hot dogs cooked in maple syrup in The Sugar House for lunch next Saturday March 2. Always a big favorite of the season. Details to follow in a day or two. 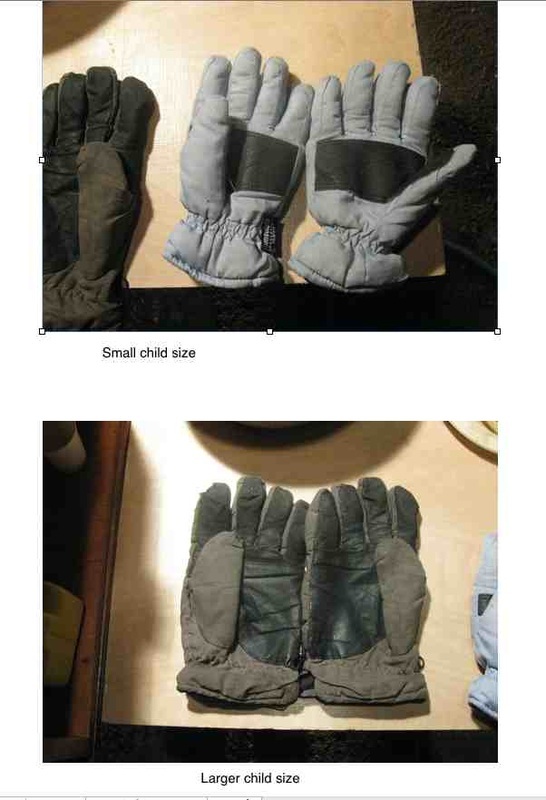 Lost and found one pair of children's gloves and one pair of small adult gloves. We collected a whopping 122 gallons of sap from 122 buckets. Yup, exactly one gallon per bucket. Really, that's the way the numbers came to me. I didn't fudge them. That's a really good run. Last night the sap kept dripping until the temperature dropped below freezing, then started dripping again this morning when the temperature rose above freezing. That was a long time dripping. We expect to get a repeat of that overnight tonight. We have now finish two batches of syrup and canned a lot of it. Batch #1 was 9.8 gallons of syrup. Batch #2 was 1.9 gallons. That's ratios of 43:1 and 48:1, respectively. Like last year (although not quite as bad) the sugar content of the sap is low (high ratios=low sugar content in the sap). Today we also got 15 gallons of sap from Erik and 6 from the Borrell family. Total sap in Batch #3, which is being boiled as I write, is thus 143 gallons. If we fast boiled it would take about 14-15 hours to boil that. Elvery has been sapmeistering since about 6:00 p.m. If he quits at 10:00 p.m., we'll have 4 hours of that done. Evaporation overnight can be about the equivalent of 2 hours of fast boiling. We'll have 8-10 hours left to do tomorrow. Peter and Rebecca&Michael have indicated an interest in sapmeistering. I and they can pretty well cover that. Help will REALLY be needed to collect sap. Some of the regulars will not be available. We may also be a bit shorthanded for splitting firewood and bringing it in. 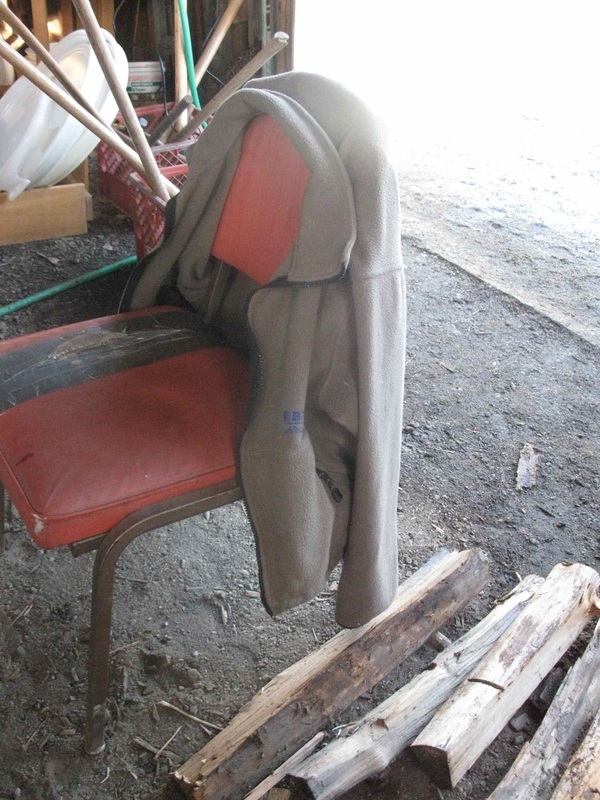 Lost and found (the jacket, not the chair). See photo attached. Low last night was 28 deg. F. HIgh today predicted to be 41 deg. F, then down to 22 and back up to 42 Tuesday. I keep pinching myself to be sure I'm not dreaming. This could hardly be better. Yesterday we got almost all of the syrup from our first 420 gallons of sap canned. That was from gatherings Wednesday 2/13 through Friday 2/22. We didn't inventory it so still don't know exactly what the yield is (something around 10 gallons). We collected an additional 91 gallons of sap on Saturday and Sunday and started boiling it. I just restarted that boil at about 7:30 this morning. See attached photos for images in and around The Sugar House this morning. I'll do this slow boil style unless someone shows up to be sapmeister. Any takers? We'll start at 3:30-4:00 p.m.
Let me know if you want to help. Watch this space. You'll be among the first to know. If you are coming and plan to do anything outside of The Sugar House, prepare for MUD. In addition to what I said in the previous message, we will be boiling the 23 gallons of sap we have on hand and whatever else we collect today. If you know you are coming, it makes me feel all warm and fuzzy to know that, and it helps a bit with planning, but do come whether or not you have let me know. Anyone coming? I've been meaning, for the benefit of newbies to The Mob, to say that a good bit what happens in The Sugar House is several people sitting around watching others work. Don't hesitate to come just for the warmth of the fire and the smell of boiling syrup. I'll be going to Brattleboro for the contra dance this evening. Anyone wish to carpool? For those of you following the details.....I didn't leave at 2:00 p.m. today as predicted. We worked until 4:00 and we got a LOT done. Prior to today we had collected 420 gallons of sap. We finished converting all that to syrup and cleaned a whole lot of stuff that needed cleaning and we did some rather time consuming important miscellaneous tasks that I don't want to take time to describe. We have somewhere around 10 gallons of syrup which would be a ratio of 42:1. The amount of syrup is an estimate. I'm hoping we really have more but we won't know until we get it canned. Do come. We need to get these things done so we will be ready for more sap next week. Fantastic sugarin' weather so far, and more predicted. We collected 55 gallons of sap today. A good run. We are boiling that plus the 24 gallons from Tuesday. This is promising to be a really good season. As early as you wish, come and be sapmeister. Starting at 9 or 10 a.m., we will filter and can the 9 or so gallons of syrup from last Saturday and Sunday's sap. Around noon or early afternoon I hope we will be finishing off the current boil. I'll be leaving at 2 p.m.
We should collect sap sometime in the afternoon, later is better, but we will do it whenever we have people to do it. Last Tuesday we collected 24 gallons of sap and threw out a lot of ice. The ice is almost all water. Almost all of the maple sugar is left behind in the liquid. We save a lot of firewood by throwing out the ice. If we put it in the evaporator we would not only have to heat it up and convert the liquid water to steam, we would also have to convert the ice to liquid water. The later takes 80 calories of heat per cubic centimeter of water compared to 1 calorie of heat per cubic centimeter of water to raise the temperature of water 1 deg. C. Melting ice takes a lot of firewood. I think I once calculated that it takes about 10% more firewood to get syrup from ice sap than from liquid sap. We have a small run frozen in the buckets. It will partially thaw, and I think we will get a little more today. We should collect. Re-boil the syrup we have on hand from last Saturday and Sunday. Add the new sap to the evaporator. Boil it until we have syrup. Tonight (Friday) leave at 6:45 p.m. to go to the contra dance in Greenfield. Let me know when you can help or just come by. Friday after 6:45 p.m. and Saturday after 2:00 p.m. I need people who can work on their own. We'll do what we can. What we don't get done we will do on Sunday or next week. here's a bad news..... no! good news story for you. i had not been able to find the hydrometer yet this year. yesterday morning i went looking for the hydrometer cup to take it with me to Amherst Farmers Supply to purchase a new hydrometer. i wanted to be sure i got the correct size hydrometer. while looking with great frustration for the hydrometer cup, i found the syrup hydrometer. (GOOD NEWS) it was packaged differently than i remembered. i had been looking right at it thinking it was a thermometer. the previous syrup hydrometer was in a dark green box, this one is in a clear plastic tube. a few hours later i went again to The Sugar House to search for the hydrometer cup. there it was in plain sight where we usually leave it over by the evaporator. (GOOD NEWS) don't know how i could have not seen it earlier. Sap will run at least a little today and there some sap in the buckets from Sunday. Let's gather starting at 3:30 or 4:00 p.m. today. We have 118 buckets to visit. Come help if you can. Cold and windy today. No sap run, of course. 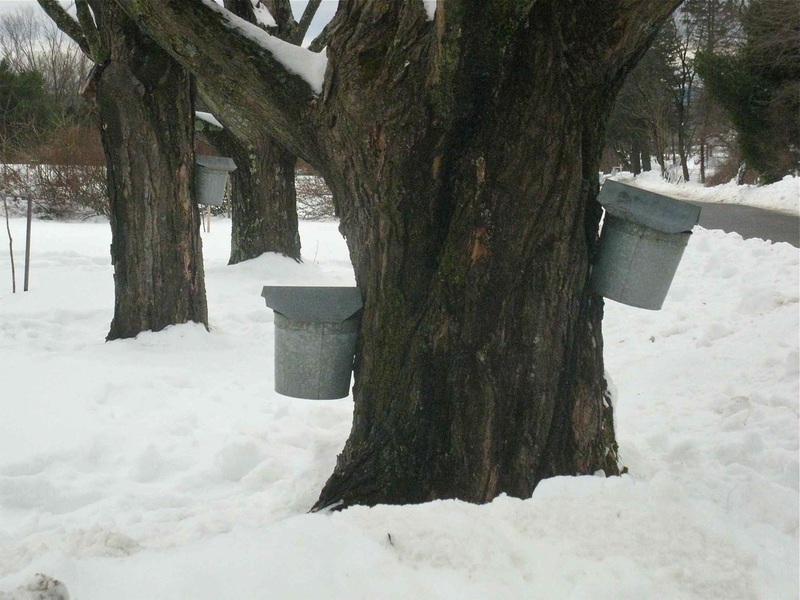 The buckets do have from almost nothing to 3-4" of sap frozen solid in them. If we do get the predicted high tomorrow in the mid- to high-40s, we will get a run, but no way to know how much. I'm not sure what we should do about collecting. If we do get a big run, or even a moderate one, we will need to collect. The forecast is also for snow and rain in the afternoon. If you are available to help with collecting sap, watch for an email from me mid-afternoon or call me. **Henry, Rob, Amy & Elvery did all the work. I helped Joyce host the family visitors including a sledding outing to the golf course. Four grandchildren and I went with wind speeds 20-35 mph. It was pretty amazing. Temperature was about 30 deg. F with sunshine. We weren't at all cold, but we sure were buffeted about. Below is the URL for a video of Erin (6) trying to get back to the place on the top of the hill where we were sledding from. It's further north out along the hill from where we usually sled. The usual area was too icy. After I stopped filming, the tube got away from Erin. It blew way way across the golf course and caught on the tree line by Pulpit Hill Road. We drove up in the truck to retrieve it after we finished sledding. Here's a video that shows the run where we were sledding and Amy (12) coming back up the hill. I didn't get any video of anyone actually sledding. Fighting the wind and keeping tubes and sleds from blowing away kept me occupied much of the time. I had a couple of fast fun runs on my Extreme Sled Mod1. It's a great sled. Look and enjoy, if you wish. Whew! A fantastic start for the sugarin' season and a great party! We have now hung 118 buckets. We have collected a total of 335 gallons of sap. We have finished off our first batch of syrup which we estimate to be 6 or 6.5 gallons from 200 gallons of that total sap. That's a ratio of somewhere between 33:1 and 31:1. We are continuing to boil the remaining 135 gallons of sap, started about 3 p.m. this afternoon. This evening I've been keeping a slow boil going. I'll stop that and go to bed soon. We will get more sap tomorrow. Then, none for a few days while temperatures plummet. Start at 10 or 11 a.m. Depending on how much sap we get tomorrow, we may get all the sap boiled or we may have some to continue boiling on Monday. I'm guessing it will be the latter. This may be the best first week of sugarin' we have ever seen. Come and help tomorrow if you wish. Call ahead or just stop by. --14 more buckets hung to make a total of 100 hung. --117 gallons of sap gathered to make a total of 197 gallons collected total so far. --enough firewood split and brought inside to last through tomorrow morning. Peter is sapmeister until relieved this evening. It's now about 5:30 p.m. Is anyone available at 7:00 p.m. or anytime on through the evening for as late as you want to go? Call you reserve your spot or just come by and see what's happening. Tomorrow morning, Erik Hjerpe is going to restart the boil very early, maybe as early as 4:00 a.m. We can use helpers anytime. Before 8:00 you're on your own with Erik. After that I'll need help with various things. From 11:00 a.m. until 1:00 p.m. we will definitely be tapping 20 to 30 more trees and getting more firewood in. Otherwise, tomorrow will be as advertised. This is embarrassing. I didn't mention sap collecting tomorrow (Friday). We have 86 buckets to empty, and we expect a LOT OF SAP, and there is deep snow between The Sugar House and some of the buckets. We need help. Sap collecting will start about 3:30 p.m.
Subject: Drip, Drip, Drip Gush! Ideal sugarin' day! Warm, sunny, little wind, trees recently frozen. Wheeee! This afternoon we collected 58 gallons of sap from 53 buckets. That's over one gallon per bucket since 24 hours ago when we collected 22 gallons. Total sap on hand is 80 gallons. We hung 33 more buckets for a total of 86. Tomorrow afternoon we could easily get an additional 80 gallons of sap, maybe more. Tonight's low is predicted to be 23 deg. F, then up to 46 in the afternoon. Couldn't be better! At noon tomorrow (Friday) I and whoever can help will start boiling. If we put wood in the evaporator about every ten minutes, we evaporate about 10 gallons of water per hour. We call that a fast boil. If we put wood in the evaporator at our convenience (usually that's me doing other things while also being Sapmeister (See Technical Note #2)), we evaporate less. I suppose maybe anywhere from 7 gallons per hour to as little as 3 gallons per hour. We call that a slow boil. Over night while Sapmeisters sleep, 15 to 20 gallons of water will evaporate from the residual heat. With some combination of fast boil, slow boil, and sleeping at night we will evaporate maybe 80 gallons of water by mid-afternoon on Saturday. That should give us somewhere between 2 and 2.5 gallons of syrup. While we are finishing that boil, we will have started the next one which will finish Sunday afternoon. The Sapmeister is responsible most importantly for not burning down The Sugar House. He/She also keeps the fire roaring by putting more wood in the evaporator about every ten minutes for a fast boil (See Technical Note #1), regulating the flow of sap into the evaporator, bringing firewood inside, and if necessary splitting firewood before bringing it in. As predicted, the wind and cold kept us indoors last Saturday. We did get The Sugar House almost entirely set up. Sunday was a perfect early spring day. Sunny, mild, no wind. Trouncing through 22" of snow was a challenge. We got 34 buckets hung. Those on the sunny sides of trees were dripping, but slowly and not for long. As soon as the sun set, dripping stopped. A photo of some of our work is attached. If you are available to help tap more trees today through Friday, let me know. I'd like to get at least 30-40 more taps in. How much sap we will get this week is uncertain. Sunshine would help. Snow on the ground and wind suppress sap flow. High temperatures in the upper 30s and lower 40s are marginal. What we need is sunshine and no wind and higher than predicted temperatures. Please arrange for any or all of those things if you can. Mark, Henry & John, all of whom could walk here, helped me shovel snow and do most of the work of setting up The Sugar House. Tomorrow will be more snow shoveling and lots of tapping with a little hauling in of firewood, maybe some splitting of firewood. This is real winter. Wheeeeee! I have had a flash of insight, I think. A good bit of what we need to do when we tap the trees is create a path to them. I envision several of us tramping down paths in addition to the usual drilling of holes, inserting spiles and hanging buckets. With paths tramped down gathering sap will be much easier. Do come tomorrow if you can. I'll copy in the plan below my signature. FOOD: I've gotten a New Orleans' recipe for red kidney beans and rice from Jon Magee. I'll have a big pot of that available and the makings for PBJs (probably not a New Orleans tradition). I do not anticipate an all-sit-down-together lunch, rather snacking whenever so moved. Then, throughout the week we'll collect sap as necessary. Maybe we will get a little, maybe a lot. We'll boil during the week, if necessary, but definitely we wii boil on the next Saturday (Feb 16). Work, music, celebrate, maybe still some sledding! Finish off the first batch of syrup of the season sometime in the mid to late afternoon. I haven't been out but Channel 22 from Springfield reports that Amherst got 22" of snow. From what I can see from inside the house, that looks about right. Our plan for today and tomorrow is as stated. I put enough wiggle room in it to allow for almost anything, namely, that we would do "as much as possible" today. We can definitely do that and maybe it will even be a little more than nothing, maybe not. Wind speed all day is predicted to be 20-25 mph. I don't think anyone will want to be out tapping trees. We'll do that tomorrow and I expect more during the week. High temperatures are still predicted to be in the high 30s and low 40s starting on Monday. We should get some good sap runs next week. I'll announce more definite plans for tapping during the week after we see how much we get done tomorrow. If any of you can get here today, we can work on setting up The Sugar House, inspecting the flue pipe and chimney (we are determined to not have those fall apart again, really, we don't want that to happen! ), inventorying jars, and washing various surfaces that have collected grim over the summer, fall and winter. Those with an overwhelming inexplicable urge to clean can get some relief. You might want to call first to see if anyone else is here. If you get the answering machine, leave a message. I'll try to check it frequently. Also, just call back after a bit. There is a telephone in The Sugar House. If I didn't answer I may have only briefly been out of earshot. Of course, don't drive until the ban on driving is lifted. I checked with the Governor. Tapping trees is not considered an essential activity. You would not be exempt from the driving ban. He lives in Boston and doesn't understand the importance of getting the taps in. If the capital of The Commonwealth were in Amherst he would know better. A wintry blast a'coming. Wheeeee! The forecast still suggests that a string of cold nights and warm days are coming although it will be starting on Monday (Feb 11) rather than Saturday (Feb 9) as previously predicted. So, as much as possible and as previously announced, let's tap and set up the sugar house this Saturday (Feb 9). And, given the challenging conditions we will most likely face, let's plan to continue the work on Sunday (Feb 10). Repeat of the above including the food. Sledding should be even better! For those of you new to the list, do not read this! Those not new to the list will recognize it as something they don't recognize. Setting up The Sugar House involves lots of not-very-glamerous cleaning. The forecast suggests cold nights and warm days starting next Saturday (Feb 9). Unless there is a dramatic change in the forecast, let's tap and set up the sugar house right then. Bring something to eat if you'll be needing a lunch. Then, throughout the week we'll collect sap as necessary. Maybe we will get a little, maybe a lot. We'll boil during the week, if necessary, but definitely we wii boil on the next Saturday Feb 16. P.S. I will try to remember to put "MM--" at the beginning of all subject lines. You can use that to automatically route Maple Mob messages to a folder in your email program if you wish. Whoopie! A successful string of workdays has concluded. See attached photos in a pdf document for proof. I like to see stacks of firewood. All is well in the sugarbush. And, uhhhh, in case I got your hopes up too much with the subject line for this message, just to clarify......this paragraph and the photos is the celebration. Sorry, no milk and cookies. NOT this Saturday. A week from this Saturday Dec 8. 5th work day of this autumn season. Most critical is to get that final platform filled and the roof on, but there are plenty of other things as you can see in the above list. As always, it makes me feel all warm and fuzzy to know who is coming (and helps a bit with planning), but do come even if you haven't signed up. Hmmmmm. Maybe it is time for something instead of, or in addition to, the milk and cookies. Any suggestions? Last Saturday we chain sawed, split, hauled and stacked. See attache pdf file with photos. I can't resist bragging. It was a great day in the sugar bush! For those who are counting, this will be the 5th work day of this autumn season. This will be the 4th work day of this autumn season. Just the afternoon this time. One of the joys of making maple syrup is getting in firewood in the autumn, the best time of the year for working in the woods. Then, eventually, what better early spring activity than again getting out into the woods to tap trees and gather sap with a warm steamy sugar house to repair to when its cold and blustery. Ahhhh! We chain sawed and split a good bit of firewood two weeks ago, but we didn't get a whole lot stacked. Thus, in addition to doing more of same, we sure could use some haulers and stackers. See photos below my signature (or maybe it will be an attached pdf document for you) for a visual stimulus to join in the fun. Milk and cookies on the porch when we finish working. It makes me feel all warm and fuzzy to know who is coming (and helps a bit with planning), but do come even if you haven't signed up. This will be the 3rd work day of this autumn season. I'm hoping for a big turnout. If it does indeed seem that we will have a crowd, I'll provide pot roast, potatoes, carrots, parsnips, onions, baked beans and fresh home made whole wheat bread for lunch. (For a smaller turnout I probably won't be as ambitious, but there will still be lunch.) Vegetarians should confer with me to help me plan a vegetarian option. Let's have a work PARTY! A musical instrument or two would be nice. Last work day we got one bridge re-positioned and lots of wood split and stacked......actually, more split than stacked. Thus, there is wood waiting to be hauled and stacked for any early arrivals at this next work day. 'Tis the tradition of The Maple Mob that you can come for any or all of a work day, even only for lunch or for milk and cookies although you will need to tolerate some razzing if you do no work, but that's a small price to pay for delightful company and food. Do come for whatever suits you. It makes me feel all warm and fuzzy (and this time will motivate me to cook big!) to know who is coming (and helps a bit with planning), but do come even if you haven't signed up. Outsides of garage doors cleaned. I'll provide cheese toast and tomato soup and drinks. Bring something else for yourself or to share, if you wish, but not required. And as always, it makes me feel all warm and fuzzy to know who is coming (and helps a bit with planning), but do come even if you haven't signed up. If you haven't seen the new website, you might enjoy taking a peak. .....and a contra dance in the evening (see the post script way below). Yes! The time has come to get firewood undercover before the snow flies.......and, I somewhat embarrassingly admit, finish cleaning up from last season. We can use dainty folks as well as big strong folks. There are always tasks for everyone. A good follow-up to this invigorating day in the sugarbush will be The Fiddlers Green Contra Dance at the Munson Library in South Amherst. b'day cake and surprises at the break!